I have been in desperate need of color in my living room. I was tired of the blah brown with warm orange. No spark, no brightness, no color. Just blah blending into blah. So when I found 3 little black plastic mirrors +Family Dollar I knew I was in luck. A little turquoise, a little gray, and a little brighter orange definitely to the rescue. I know these aren't the original frames, but they are very similar. Just to give you an idea. To paint over the mirror part I used painters tape and taped down the brown kraft paper onto the mirror. It worked great! The only hard part to spray painting these mirrors was getting into all the nooks and crannies, but after a little patience and several layers I finally got it all covered. I totally know what you mean by blah! One day I was looking around my room and realized that everything we had was brown. Brown, brown, brown. Little splashes of color like your mirrors make a big difference! Great job. These are so cool and I love the colors you chose too! You should come decorate my house. How fun! Great job, Bobbie. I love the colors you chose, and changing the angles of the mirrors makes them look like you bought two different styles. Great idea. They look great! Can you use any kind of spray paint on the plastic or is there a special type you need to get? Really nice upgrade! I love spray paint! There are special spray paints for plastic that you can use. I didn't. Where these won't be bumped and scraped I figured the regular ol kind of spray paint would work just fine. So far (6 months later) they are still looking just as good as the day that I sprayed them. Hope that helps! I moved into my home in July, so I still have empty wall space. This is a great idea. I'll be on the lookout for some fun mirrors. Thanks for sharing. What a great idea! My house is lacking so much in the way of design. I think the fact that it is a "fixer-upper" and we haven't quite finished the fixing I get discouraged and hope semi painted walls count. I will definitely be trying this out though! And the kids would love to help me, I'm sure. That is a neat craft, I especially like the turquoise one. my favorite color. I love the colors. I love how you transformed a $1 item. How cool - I love things that don't cost much and that you can personalize for your own space!! Beautiful! 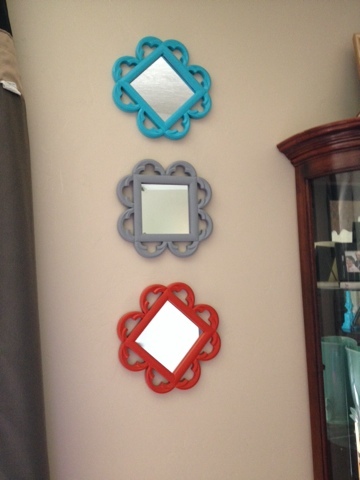 What a great and inexpensive way to add some color to a room! Love this idea! very creative and great way to jazz up the house ! So pretty! I love the colors you chose. Very creative. I love that you angled them differently. Super idea. I've been meaning to spray paint a thrift store mirror for my daughter's bedroom and you've inspired me! Gotta love the dollar store. These turned out great. What a fun project!